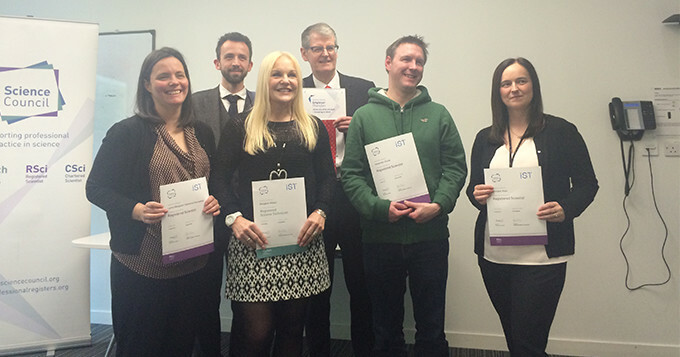 The Science Council visited the University of Strathclyde in Glasgow yesterday to award its Employer Champion plaque to the Dean of Science, Professor David Littlejohn and to present its first four professionally registered scientists with their certificates. Employer Champion status recognises the University of Strathclyde’s commitment to championing the values of professional registration and supporting its scientific staff through the registration process as well as recognising staff who become registered. We welcomed Emily Bulloch and Alan Corrie from Exova, the Science Council’s first Employer Champion, to the event. Emily gave a presentation on her experience of Science Council registration and discussed her plans for progressing through the registers with the support of her employer. We also heard Alan speak about the Employer Champion relationship that Exova has with the Science Council and how it has enabled the company to support the professional development of its staff. Following the presentation of certificates to the four new professionally registered scientists, we were treated to a talk from University of Strathclyde employee Lynne Kernweiss RSci, who contextualised her daily practice with a fascinating demonstration of some of the equipment she uses. We look forward to welcoming many more University of Strathclyde staff to our registers. If you want to know more about your company becoming an Employer Champion, find out here.